I lived in Geoje, South Korea for 2.5 years. Korea is a beautiful place. They have a rich culture and people are friendly. They are willing to give a helping hand even if they have a difficulty speaking in English. I tried to visit so many places despite the fact that I don't have my own transport. Geoje is 4 hours from Seoul. Now that I'm in Australia, 4 hours seemed close. But for someone who relies on public transportation, 4 hours is a long way. In my 2.5 years in Korea, I only managed to visit Seoul trice. When I got an opportunity to go to Australia, I resigned from Samsung Heavy Industries. It was a sad moment, but I have to move on. This was a good timing as two of my friends are going to visit Seoul, South Korea. I plan to arrive at Seoul, meet them there and go home the same time as they did. This is my final tour, my third time in Seoul. 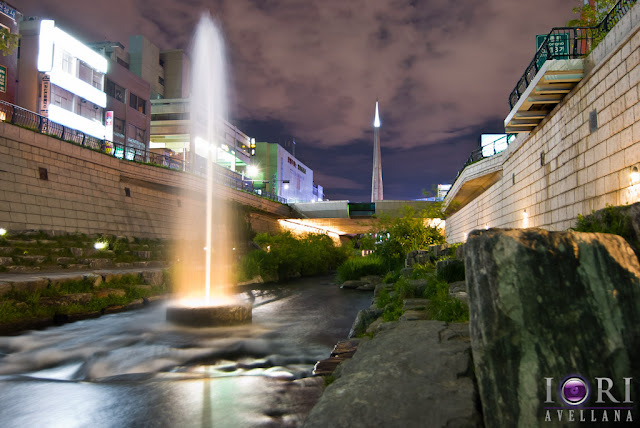 One of the places we visited was Cheonggyecheon Stream. Its a narrow yet long creek in Seoul, South Korea. This creek was just recently restored and modernised to meet todays demands and attract tourist. This is a beautiful place! Why didn't I go here in my first visit?! Why didn't I found it when I searching the net! From Wikipedia, Cheonggyecheon Stream seemed to be a vast undertaking. It was already running into the inner city but only just recently that it had been reconstructed. 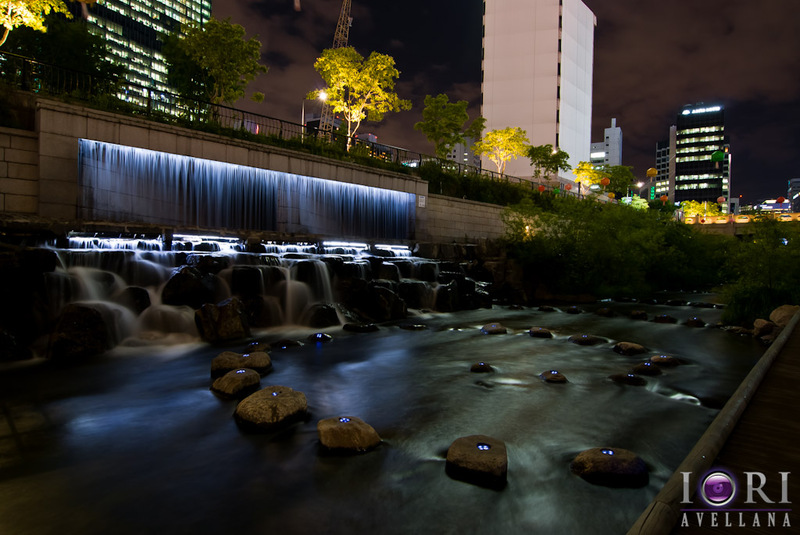 I enjoyed the beautiful scenery and relaxing walk at Cheonggyecheon Stream. I must admit, I didn't walk the long stretch - it was 11 kilometres! Above is a short walk we did. It's from Jongno 4-Ga station to Jongno 5-Ga station (and a bit more). You won't miss it as the Jongo train line is conveniently routed at common transfer stations. Due to its length, there are many train stations which you can use to go here. This is a long stream. You'll need to walk to maximise this experience. If you don't want to walk the whole stretch, it's best to Google it. I'd recommended both ends of the stream and some parts in between. 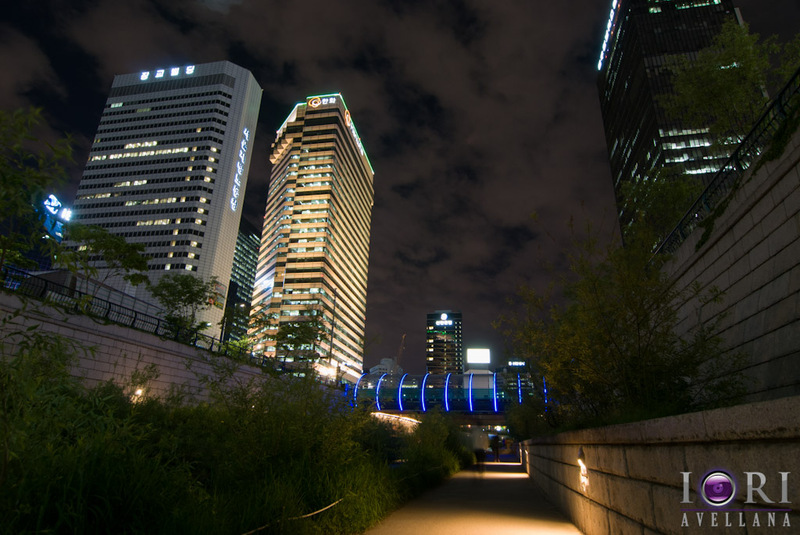 The photos I have here are taken between Jongno 4-Ga and Jongno 5-Ga. I must admit, I didn't see both ends of the stream which are significantly beautiful landmarks. Since the trains are nearby, you can drop by any station and walk towards the stream. I visited this place both during the day and night. Both are fantastic. For the photographer, night time might be better - but it all depends. Bring either your walk around lens or a wide lens to capture most of it's beauty. I'd prefer to walk here at night as the high contrast of light and darkness are visually excellent - very good for photography. If you're here during spring or autumn, the trees at both sides will give more depth to the scene especially during the day! Whenever you choose, it's always an excellent place to visit. At day time, there are many people walking along the banks. It's a popular tourist attraction as well. But the stream never gets crowded. Benches are scattered all over the stream. This might, at least, entice those who want to walk the long stretch of the stream. This is a great place to host festivals. In 2012, a Lantern Festival was held here. I already saw a Lantern Festival in Jinju before so I know how beautiful that festival is. A Lantern Festival is a night activity in which different groups participate to create a lantern. These big lanterns (like floats in festivals) are mounted on boats and float on the river or stream. They lit up the night and it's beautiful to see different designs of these lanterns. There is a dedicated website for Cheong Gye Cheon Stream. Please visit it when touring Seoul, Korea. It has an English translation. 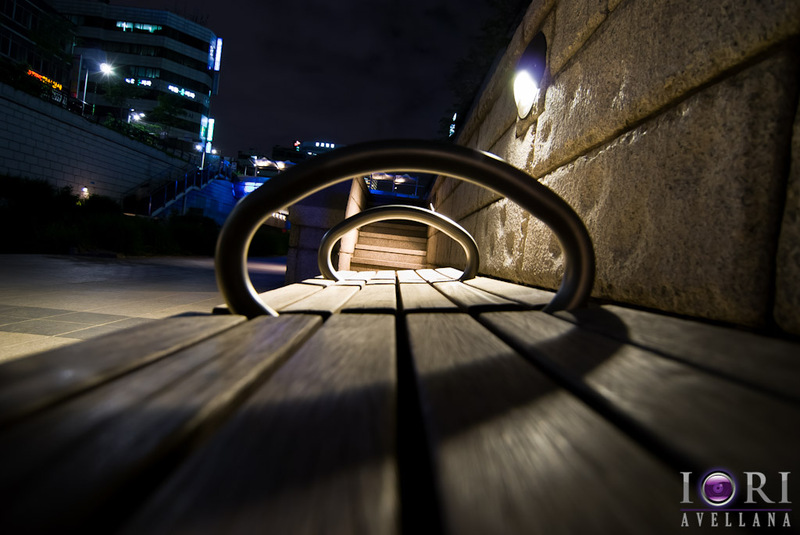 Although night photography is great, there's no harm shooting during the day. But I'd frequent this place during the night when I have a chance. If you're here during fall or spring, you might be on a treat! The plants at the banks change color during during these season and it will add drama to your photos. 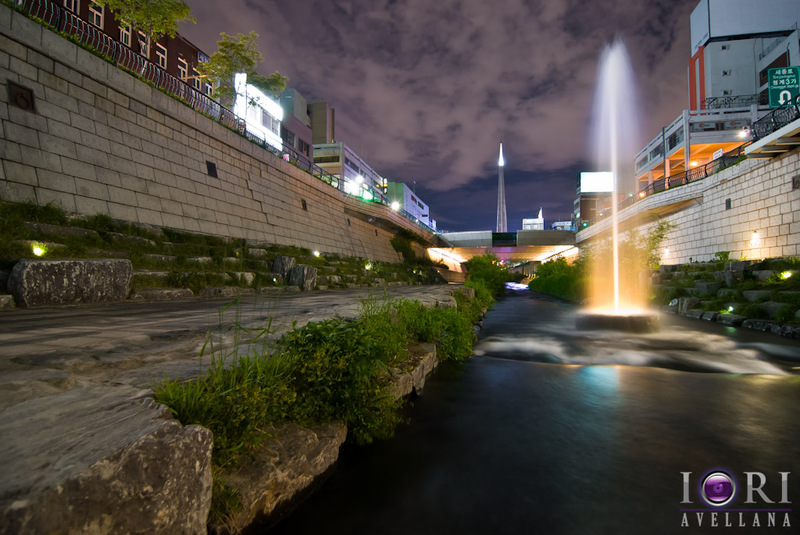 Cheonggyecheon Stream is one amazing walk! I love going back to this area. Its relaxing and there are many subjects to photograph. Since Seoul sponsors many events and festival, its great to check these events especially if Cheonggyecheon Stream is a venue - you won't be disappointed! If you're planning to visit Seoul, consider this area. This is one area that you can hangout during the night. 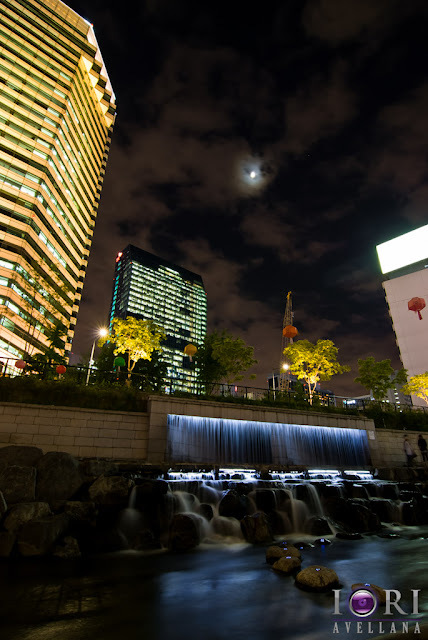 Though Korea is a night city, you won't get board roaring around Seoul all night!